After the wild, as expected, conclusion to Sunday's race at Talladega Superspeedway, the field for the Eliminator Round of the 2014 Chase for the Sprint Cup was set as the field of 12 drivers was whittled down to eight. I was not nearly as good predicting this past round as I was the first round, only getting one eliminated driver correct. This round will set the field for who will run for the title in Homestead in a little more than three weeks, who will those four drivers be? Here is how I am projecting the standings for following the Phoenix race, with projected winners listed at the top. Gordon was not as sharp in the Contender Round as he was in the Challenger Round, but he did enough to advance. He has ran well all year and has shown the necessary combination of running up front for wins as well as consistent finishes at or near the top. And we all know how strong he is at Martinsville with eight wins and he is the defending winner of this race. Gordon seals his Homestead ticket early. 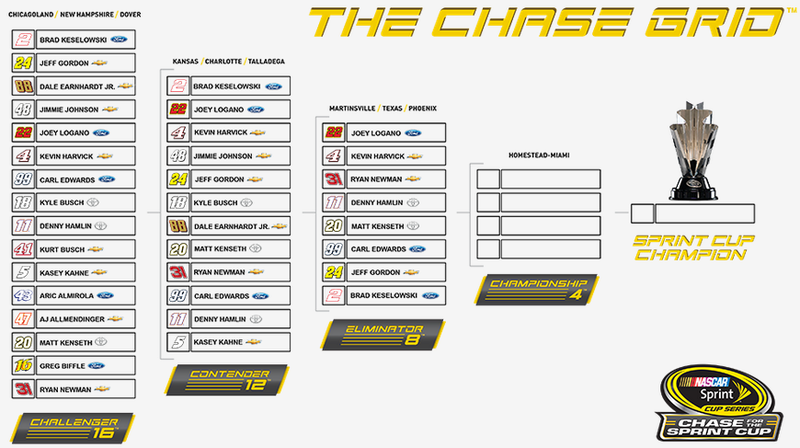 Logano won the spring race in Fort Worth and I expect him to continue to advance to the following round by winning. Logano doesn't have a great long-term track record at Texas but with how strong his Penske cars have been, particularly of late, you have to go with the hot hand. Harvick is money at Phoenix. He has won three of the last four races at PIR and has won this race the last two years. He also has the well-deserved reputation of putting himself in position to win races and I think he will be and win-and-in this round like he did this past round. Keselowski basically had to win to advance at Talladega and he was able to fight through some wild racing late to do just that. Considering how strong he has been all season, it was a little odd to see him have to scratch and claw so hard to get to the Eliminator Round but considering the mess of a Kansas race and the infamous Charlotte race, you do have to give him credit for getting it done. He historically has not been that great at the tracks that comprise that round but I do believe that he and crew chief Paul Wolfe have regained their confidence to advance to Homestead. Newman deserves a ton of credit as he has been running very well of late without suffering any poor finishes. He has an average finish of 6.5 in the last four races and he hasn't finished outside of the top 18 since his last DNF at Watkins Glen two months ago. However, he doesn't historically have a great record at the Eliminator Round tracks. But he has been a sort of Steady Eddie of late so that may lead him sliding to the Championship. Over the last couple of months, Kenseth has been relatively hit-or-miss, seemingly following strong finishes with mediocre or passable finishes. He has run solid of late but for some reason, he hasn't been able to get himself to Victory Lane at all this season after winning seven times last year. He'll be close to advancing but I don't think he will get it done. One of those guys who has survived who I predicted to be eliminated in the Contender Round is Cousin Carl as he has run relatively well this Chase to get to this position. That said, he hasn't been that competitive for wins this season even as he has two wins as he only has led 135 laps this season, and 104 came in those two wins. I think that lack of consistent front-running will handicap Edwards this round. Hamlin does have the record of running very well at these next three races, which could bode well for him. However, he has been pretty hit-or-miss in his own right as he has the lowest average finish over the last five races of all the Eliminator drivers. He is going to have to step it up if he wants to run for the title.